When lemons are plentiful it's time to make Lemon Curd, and maybe Mini Lemon Curd Tarts! Who doesn't love lemon curd? It's one of those pricey gourmet items few can afford to buy on a regular basis. I have an easy and fool proof recipe to share with you that's so much better than store bought! 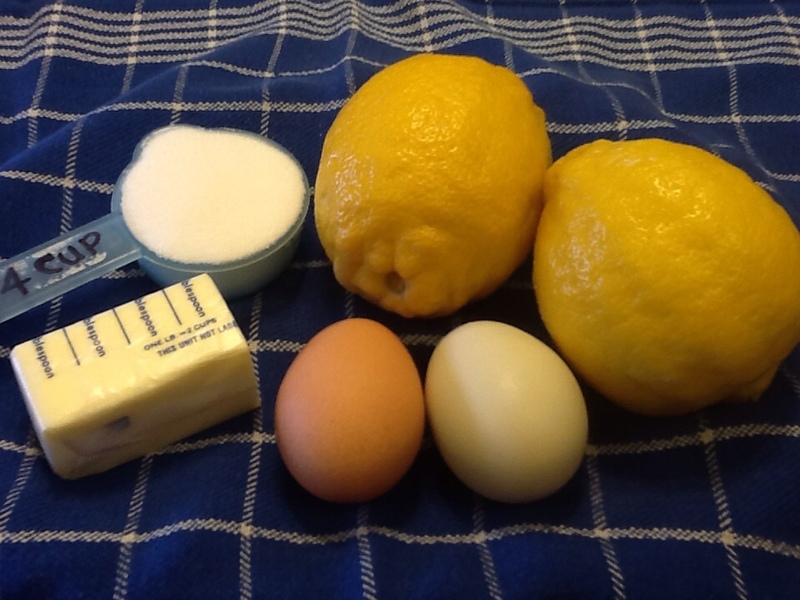 4 Simple ingredients for Lemon Curd. The secret to a-mazing Lemon Curd is giving this recipe your undivided attention for 5 whole minutes! I know you can do it! So here goes! 1/4 cup + 1 tablespoon granulated sugar (I use cane). Finely grate the zest of 2 lemons ( the thin yellow part, not the white). Juice lemons to equal 1/2 cup of lemon juice. To a 4-cup microwaveable bowl add: Lemon juice, lemon zest, sugar and butter. Place bowl in microwave, uncovered, on HIGH for 1 1/2 to 2 minutes of until butter is melted and mixture is hot. Beat eggs with wire whisk in a bowl (I used a 2-cup glass measuring cup). Drizzle hot lemon mixture into beaten eggs, whisking constantly! Return mixture to 4-cup microwaveable bowl. Microwave , uncovered on MEDIUM (50% power) for 1 to 2 minutes or until thickened. Stop microwave every 30 seconds to stir and check for thickening. (the underlined is critical to your success!). Mixture will thicken as it cools in the refrigerator. Pour into container with tight cover, and date. I use permanent marker on a piece of cellophane tape. Lemon curd may be refrigerated for up to 2 weeks or kept in the freezer for several months. 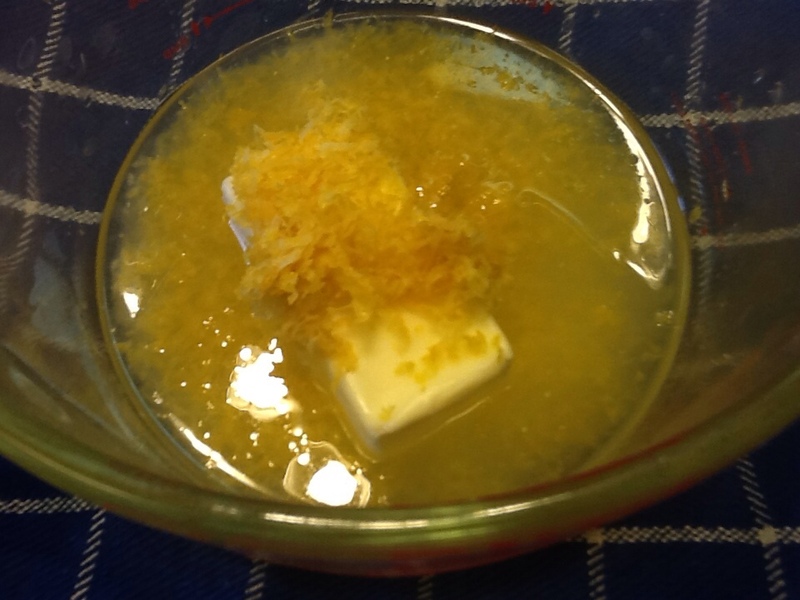 Place lemon zest, juice, sugar and butter in 4-cup bowl. 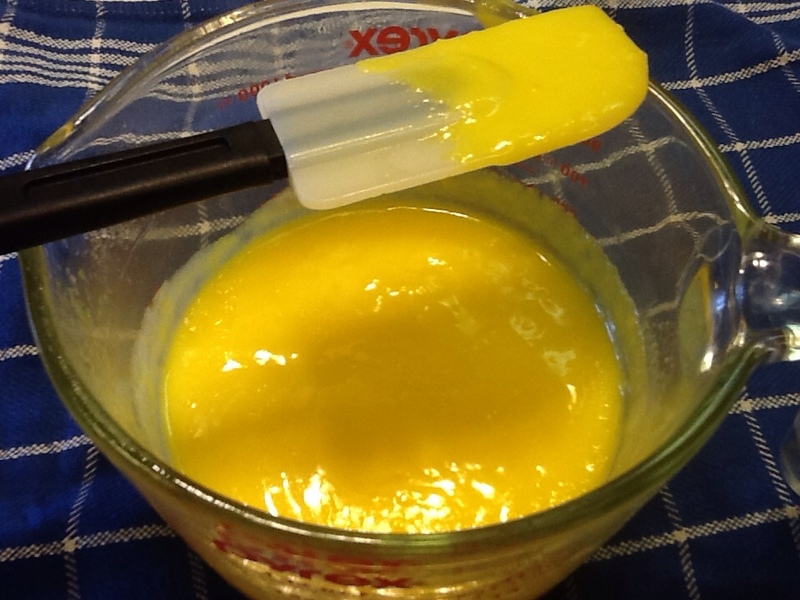 Thickened Lemon Curd will coat your spatula. 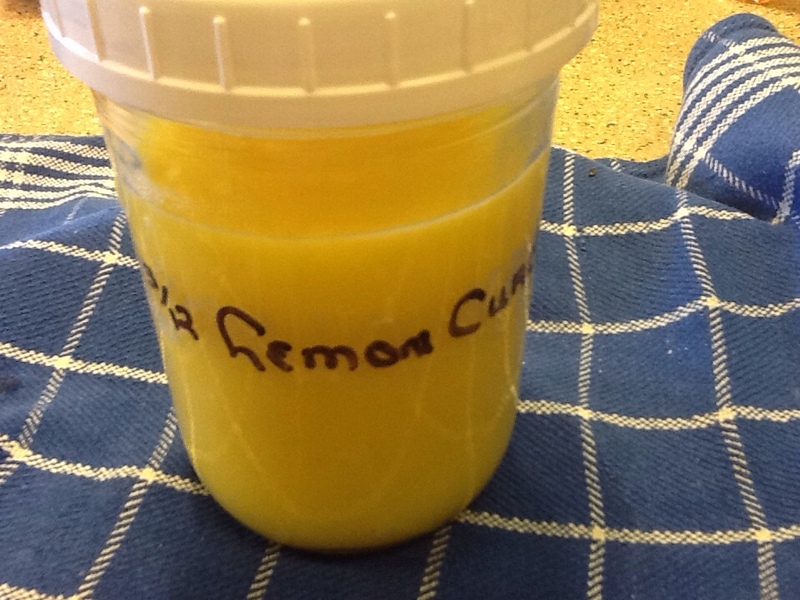 Lemon Curd labeled and dated, stored in 16 ounce canning jar with screw-on lid. Zest of 2 large tangerines, don't use a micro plane, you'll want the zest a little larger when zesting tangerines. Juice from tangerines 1/4 cup (2 ounces) and juice from 1-2 lemons 1/4 cup (2 ounces). 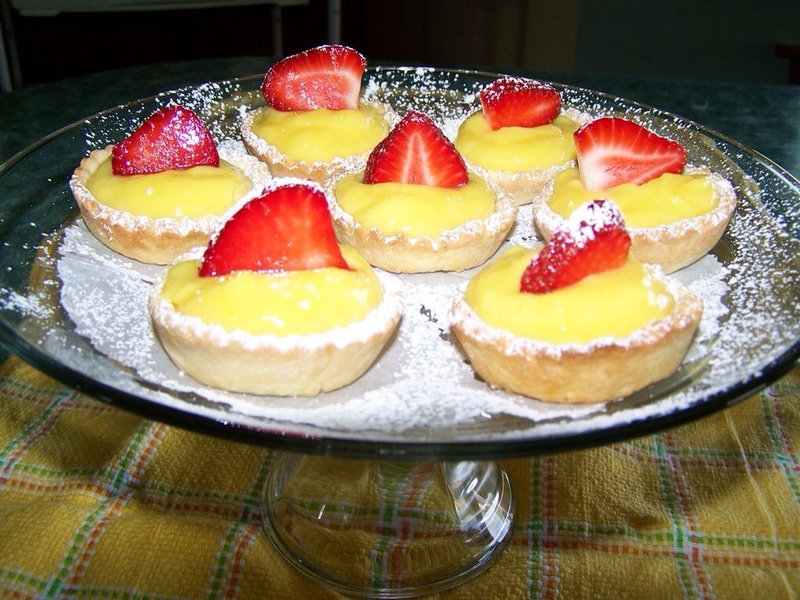 Use Lemon Curd for mini tarts, a great dipper for blueberry scones, filling for mini cream puffs, as a spread on biscuits, or toast . . . YUM! If life hands you lemons, make Lemon Curd! Our lemon and tangerine trees are loaded with tasty fruit. I can't think of a better way to preserve their great favors then by cooking up several batches of Lemon and Tangerine Curd . . . Over at Julie's!!! 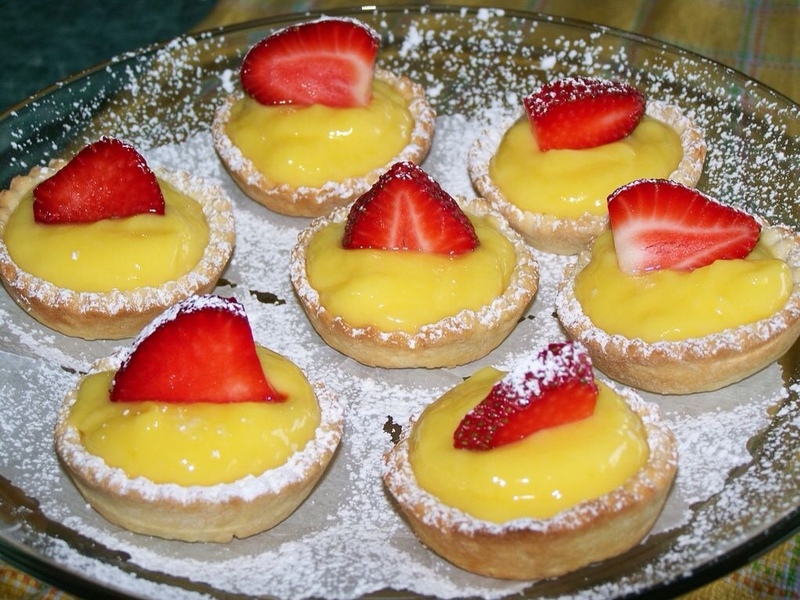 The perfect ending to an Easter lunch, Mini Lemon Tarts! I changed the font to Arial, hope that helps! The recipe calls for 1-half cup of lemon juice, 1-quarter cup of sugar plus 1 tablespoon, 1-quarter cup butter, and 2 eggs. Sorry for the trouble! Thanks Julie, I look forward to trying this receipe...Love your blog BTW!! So, It hink this will work fine in a non-microwave setting (I don't do microwaves). More soon. Thanks for the inspiration! Good for you! I wish I could break the habit, t saves me so much time especially heating up leftovers and not having to wash a pot and a dish. I have converted to glass only when microwaving. The lemon curd is tasty and a thing of beauty! Hope you enjoy making it!